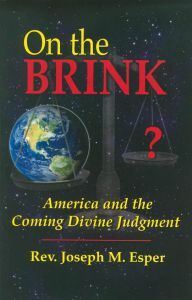 In On the Brink, America and the Coming Divine Judgment, Rev. Joseph Esper lays out a strong case that America will soon experience a powerful and historic manifestation or Divine Judgement. God exercises His authority not to take vengeance on sinners but to invite, urge and compel them to repent and thus avoid everlasting damnation. In the words of St. Augustine: “Rome was not punished because she was Christian, but because she had failed to right herself from a course of sin.” This holy Bishop asserted that because nations exist only in the realm of time and space not eternity, they must be chastised or rewarded for their evil or good deeds here in this world. The sufferings involved in societal calamities are a source of purification for the just and of chastisement for the wicked. Scripture states that God “shall judge between the nations, and impose terms on many peoples” (Is. 2:4). America has been richly blessed by God, and America is also subject to His decrees and judgments. While we as a nation once built our society’s foundations solidly on rock, we are now foolishly tearing them down and attempting to rebuild them on the sand of materialism, moral relativism, and national arrogance-a decision that can only lead to disaster (cf. Mt. 7:24-27). In a very real sense, the struggle for America’s soul and its future “is not with flesh and blood but with the principalities, with the powers, with the world rulers of this present darkness, with the evil spirits in the heavens” (Eph. 6:12).